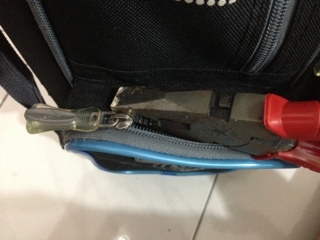 Tonight this one is challenging me, I can't fix the school bag side pocket zip. I tried a few time to squeeze and pull to join up the chain back into the track, but fail to do it. How? Immediately get my phone and hop on to ask Uncle Google "how to fix a broken zip" and I watch how to repair in this Youtube. 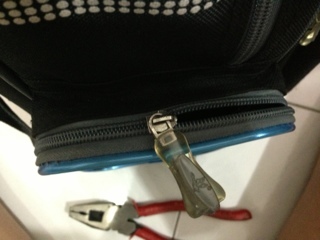 All you need is a plier, then put pressure to both size of the slider. 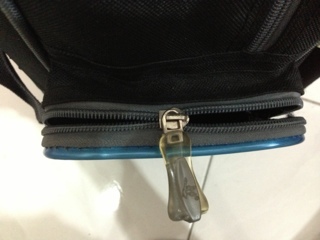 Then try to pull it, if the zip chain still cannot get together, tighten the slider again till you can get it fix. Tadaaaa...it is actually so easy to fixed and it works! 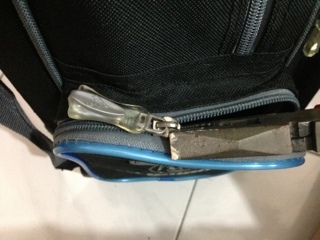 UPDATE: The next day, the zip spoil again and I repaired it in the same way. I think too many time of pressure given to the slider, it is now broken. The slider and pull tab comes off now.